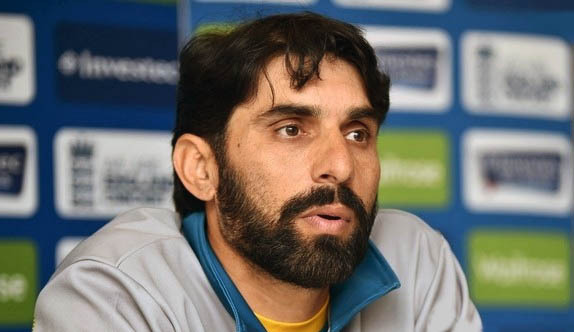 A cricketer, who is holder of an MBA degree from the University of Management and Technology Lahore, Misbah ul Haq was born on 28 May 1974 in Mianwali. He is related to the former Pakistan captain turned politician Imran Khan. Misbah is currently the captain of Pakistan national cricket team and is a middle-order batsman best known for his composure with the bat. He has also the ability to be an aggressive big shot player. He was initially noticed for his technique and his temperament in the Tri-nation tournament in Nairobi, Kenya in 2002, where he scored two fifties in the three innings but over the next three Tests he played against Australia, he failed to score more than twenty runs and was soon dropped from the team. However, at the age of 33, Misbah was chosen to play in the inaugural ICC World Twenty20 in 2007. Because he had been regularly making runs in domestic cricket and in the years before his recall he was consistently one of the top run scorers in Pakistan at each season's end, with his first-class average briefly climbing above 50. Misbah was one of the stars of the tournament, playing a large part in many thrilling run chases in the group stage against India where he scored a half century in a tied match. In their Super 8s encounter with Australia he was named Man of the Match with an unbeaten 66 off 42 deliveries to see his side home with 5 balls to spare. Another unbeaten innings in the semi-final against New Zealand saw Pakistan book a spot in the final against India. Misbah played an instrumental role in Pakistan's recovery in the inaugural 2007 ICC World Twenty20 final against arch-rivals India, with three sixes. Misbah scored his first Test hundred against India at Kolkata in the 2nd Test of the 2007 series. After India managed 616 in their first innings, Pakistan were at 5 for 150 in reply and in danger of following on when Misbah and Kamran Akmal put together a match saving 207 runs. Misbah finished on 161 not out. In the 3rd & final Test of the series, Misbah made another century this time finishing on 133 not out. In 2008, Misbah was elevated to the post of Vice Captain of the Pakistan team and was awarded a Grade A Contract. Since returning to International Cricket for Pakistan, Misbah has gone through a sustained patch of prolific run scoring. In his last 5 Test Match innings for Pakistan, he has notched up 458 runs at a very high batting average of 152.67 against India. In his last 5 ODIs as well, Misbah has made 190 Runs at an average of 63.33. He holds the record for having scored the most ODI fifties without ever having scored a century. Misbah was dropped again from the team after the 2010 ICC World Twenty20 owing to a dismal performance with the bat but due to the batting-collapses that Pakistan suffered during England tour 2010 and spot-fixing controversy, Misbah was recalled for the subsequent tour against South Africa in the UAE to lead as a captain of the team. So far, Misbah has led Pakistan in 21 test matches, winning 10, losing only 4 with 7 draws. In 2012 Misbah led Pakistan to a clean sweep against the world number one ranked team England. He is also the only 2nd Pakistani captain to win the Asia Cup after Moin Khan. He has won 6 out of 10 series during his captaincy, winning series against New Zealand, Zimbabwe, Bangladesh, Sri Lanka, England and South Africa, a feat no other Pakistani captain had been able to manage before Misbah. Apart from his own outstanding performance, one has to give full credit to Misbah as he has stabilised the Pakistan team. He makes the boys feel comfortable and relaxed so they actually enjoy their cricket. He is mature and willing to listen. The only unfortunate thing with Misbah is the age factor which is not in his favour.